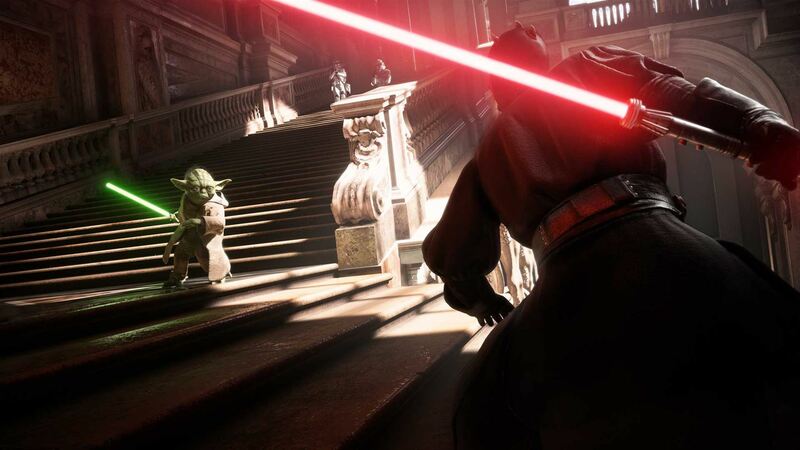 Battlefront 2’s five modes might look a bit sparse on paper compared to the 2015 game, but in reducing the amount of modes, they have become more focused. And as multiplayer is the biggest draw with this game, it’s a good place to start this off. 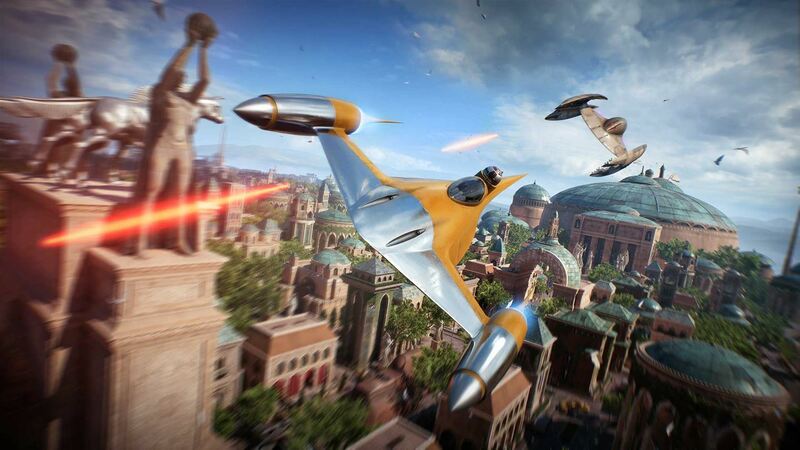 Galactic Assault has been the mode pushed in the advertising of the game since the big reveal at E3, with Starfighter Assault coming in later as the second big mode. For Galactic Assault, the action is mostly on the ground, with three phases split across four ‘missions’. In any one of the eleven maps, the attacking team will either hack systems, defend transports, capture and hold areas, or protect a charge from being switched off. It works well, and all of the maps feel different – both in terms of objective and aesthetic. Which is great work in a game that has almost two of every biome. Jakku and Tatooine are both desert worlds, but they both have differing features in how the map plays. And that goes for the other maps as well. However, sometimes these matches can be won quite easily on the first stage, especially if that first stage is a capture and hold. A ticket counter for the attackers gives them limited reinforcements to get the job done, so if the defenders can do their job well enough, the win goes to them. Of course, that’s not really a negative point against the game, as this is the standard two teams format, and it always is based on the skill of the players [and a bit of luck in some cases]. I’ve had the most fun in this mode, and like Walker Assault in the 2015 game, will more than likely be my go-to mode whenever I hop on. Starfighter Assault has fewer maps, but still manages to be diverse with them. Kamino takes place around the cloning facility instead of being out in space, for example. Endor has the battle within the debris of the Death Star. The objective for the attackers in this mode is to destroy the systems of either a cruiser or space station. Flight control is vastly improved in this game, and the removal of a lock-on for primary lasers is very welcome – as is the removal of automated rolls. They always felt sluggish when used in the 2015 game, and not very effective all that often, so always being in direct control of whichever ship you use is great. New Hero ships have been added for the additional eras, so Yoda’s Jedi Interceptor faces off against the Scimitar of Maul’s, and Kylo Ren’s TIE Fighter squares off against Poe’s X-Wing. There’s also a second Millennium Falcon that’s been added representing the sequel trilogy. Just like the heroes themselves, each new addition has something that sets it apart from the others. From a starfighter focused mode to a hero focused one, Heroes vs Villains returns. Instead of being brought over untouched, it’s seen a complete revamp. Four light side vs four dark side heroes enter the battle with a set ticket count. One person per team gets chosen as a target, and whichever target gets defeated loses a ticket for their team. The team that manages to keep at least one of their tickets wins. And this seems like a good time to talk about those heroes. Returning for the light side are Han Solo, Lando Calrissian, Luke Skywalker, Chewbacca, and Princess Leia, with Rey and Yoda being new. For the dark side, Boba Fett, Bossk, Darth Vader, and The Emperor return, with Darth Maul, Kylo Ren, and Iden Versio being the new additions. At the start, only Han, Lando, Rey, Yoda, Boba, Bossk, Maul, and Kylo are unlocked. Everyone else needs unlocking through credits earned by playing. Before all the controversy that hit, Luke and Vader were 60,000 credits each – and when each match is paying out only a few hundred at a time, that’s a lot to save up. Fortunately, all unlock prices were slashed 75%, so now they only need 15,000. The mode itself is fun, and works well, due in part to the smaller sections of maps they take place on – as all small modes do. The last new mode is Strike, where 8v8 matches are played. The idea here is that one team has a ‘flag’ that needs to be taken into the enemy stronghold. If the defenders can stop that from happening, they win. It’s a mode where sometimes rushing it can help while other times you’ll need to fight hard to make progress, all the while keeping that flag held by someone. Heroes and vehicles aren’t allowed here, so it is purely a clash of classes. Blast is the other returning mode, and remains the basic team deathmatch mode it always was. Which is to say still a good mode for those who want nothing but a standard shootout. New to this game are the campaign and the arcade mode. The campaign follows Iden Versio and Inferno Squad – a top special forces unit within the Empire – during the waning days of the war. 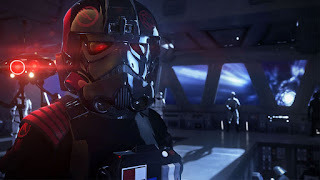 The plot itself is focused more on the characters than any of the events that surround them, so while we see Operation Cinder, the retreat from Endor and others such things, the focus remains on what the characters are feeling more the details of those events. As for gameplay, the mechanics from the multiplayer carry over here. Upon being defeated, you can swap out weapon and star cards to try a different approach. Some levels are quite decent in length and offer quite a lot to do. The first mission has you controlling Iden’s droid as it makes its way to her through the rebel ship. The second half then has you controlling Iden herself. Endor has you storming several groups of rebels before getting into a TIE Fighter for some aerial combat. Other missions will have you playing as other heroes such as Luke or Leia, but these aren’t quite as good. Objectives in these missions are usually to defend for a certain amount of time before moving on to the next part of the map. However, for a campaign of roughly four to six hours in length, it offers a good experience. 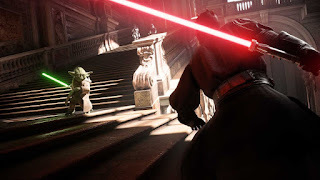 As for Arcade, there’s eight different scenarios to play for both light side and dark side using either the team match or onslaught templates. Team match is basically Blast under a different name, with onslaught being a one vs many template. Each mission has three difficulties, with the first difficulty being completed to unlock the next. These missions are fun, but mostly Arcade will be used for Custom Battles. For now, there isn’t much to it. Various factors can be changed, such as how the classes are used [battle points from multiplayer, everything free, heroes only, etc], how many units each team has and the reinforcement tickets available. The planet that is played on can be selected, but not every planet is available. For consoles, this is still great for those local multiplayer matches – even if, and I know I’m going into territory I don’t usually go, it doesn’t match the quality of the original Battlefront 2 in terms of choice. The sound design is great, as are the visuals. There’s a lot more proper Star Wars music in the game this time, but the voices of heroes still fall a bit flat in terms of being accurate for some. All units within the game can be buffed using star cards. Unlike in the 2015 game where these were bought with credits after attaining a certain level, we have… loot crates. The most expensive crate is 4000 credits, and with that you can get anywhere from three to six cards. However, not all of those cards will be actual star cards. One of those gives credits, and another gives crafting materials. These crafting materials can be used to upgrade cards, or get new ones, and is really the only part of this system I like. Star cards themselves can no longer be placed in one of the three slots available [which already have class specific items inserted] but instead overwrite one of the three. It feels limiting in an already limited system. Trait cards are included, and can be upgraded just like the abilities. Three cards can be active per class [after collecting ten ‘ranks’ for that class], but each class has their own star card sheet which includes those traits. Again, limiting. However, with or without the system being an active part of how you play, the game itself is still fun and you can still use the standard classes without star cards and still progress. Heroes and vehicles also have star card sheets with specific ability upgrades and additions available. Guns are thankfully tied to missions, which track progress within the game. Using a class for a certain amount of time, getting kills with that class, and getting kills with weapons of that class will unlock class-specific things. Kills with the class gets new guns, and kills with a specific gun unlocks add-ons for that gun. Kills with other weapons will give a crate for a specific item, which really begs the question of why it couldn’t just give that thing without the need of a crate. I’ve talked enough about that system, and no doubt you’ve heard all about it from the controversy anyway, so recommendation time. Star Wars fans wanting a solo adventure won’t get much use out of this game, but everyone else I think will find it fun. How much you cherish an actual progression system over luck-based crates will be the overall factor though. While I wouldn’t say this should affect your decision, I’d also advise thinking about whether you found the 2015 game’s loadout customisation better than the one here. Otherwise, there’s a lot more here than in the 2015 game, so if you can overlook some of the factors, there’s a great game waiting to be played. And all content being free isn’t that bad either, right?